Whoah! Who would do something like this to an unsuspecting Jazzmaster body? About a year ago you showed my 'plank guitar' on your blog. I have been building some more strange guitars and here are some pictures of the last project. 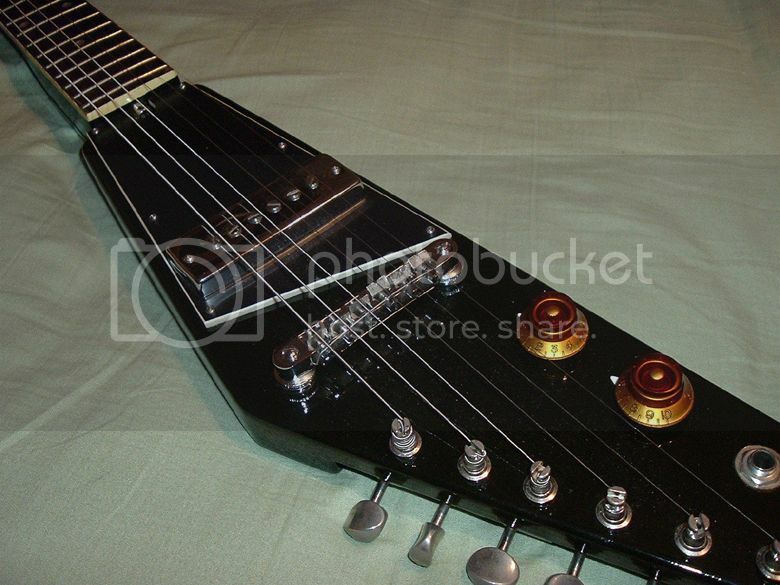 It is a so-called third bridge guitar with baritone neck and Bass VI strings. Those were the only strings I could find with sufficient length. 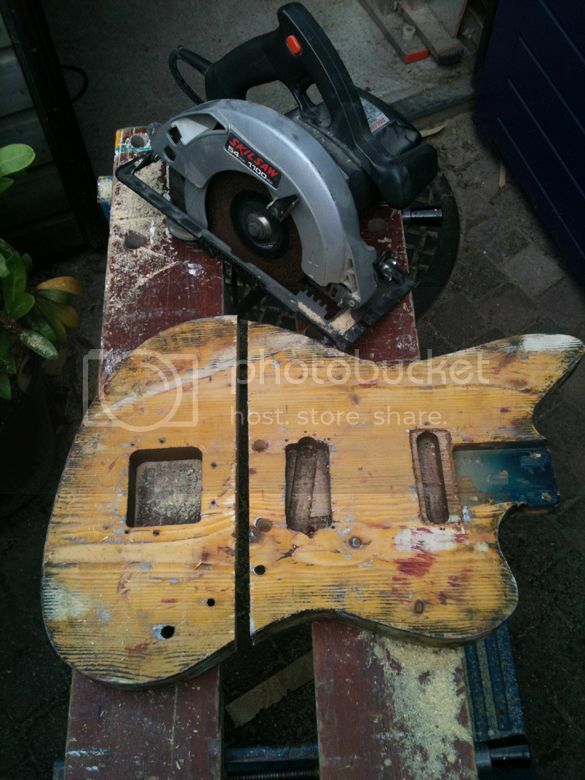 With a circular saw I cut the body in two pieces, add some wood and glued it all together. The extra wood was necessary to get enough length. There's a slight nod in the body to get enough tension on the strings. In the end I have to say: it plays and sound a lot better than I had previously thought! Thanks Erik! I'm sure the Guitarz readership would love to hear how it sounds. Do you have any sound clips? 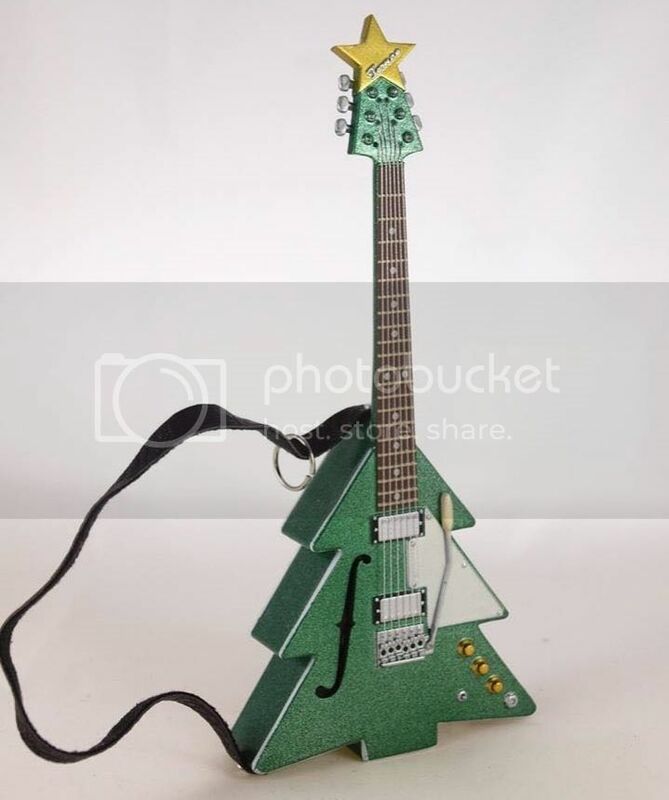 I don't actually know if this hollowbody Framus Christmas Tree guitar is a genuine guitar or not; there is something about the photo that makes it look like a miniature. The strap looks very unconvincing, whilst a Strat-type tremolo on a hollowbody doesn't quite seem right. However, I think it is an entirely appropriate image to convey the compliments of the season to you all! 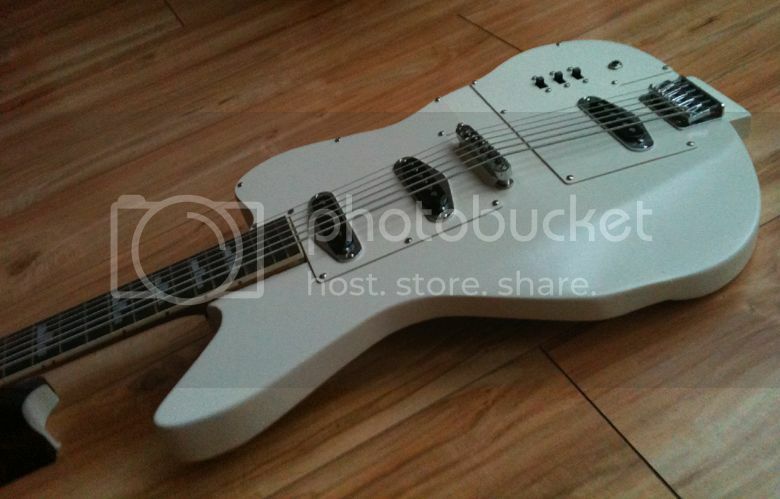 Weird minimalistic headless guitar with case ... Can you identify? Hello! This guitar is in very good condition. I don't really know anything about it as far as history goes. It appears to be a one off prototype. There are no markings or serial numbers or anything like that. It sounds really nice and everything seems to work great. Free priority shipping. Thanks! Which doesn't tell us a great deal. 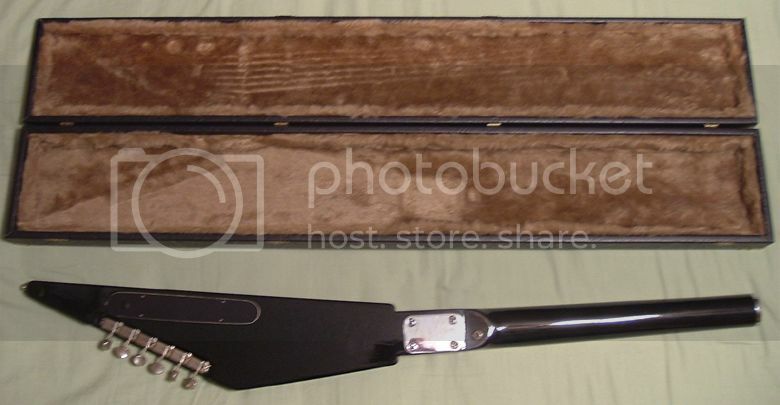 In the listing title the seller has queried "Steinberger? Gibson? Hohner?" but I think we can safely ignore those red herrings, they are just there to get people to look at the listing. 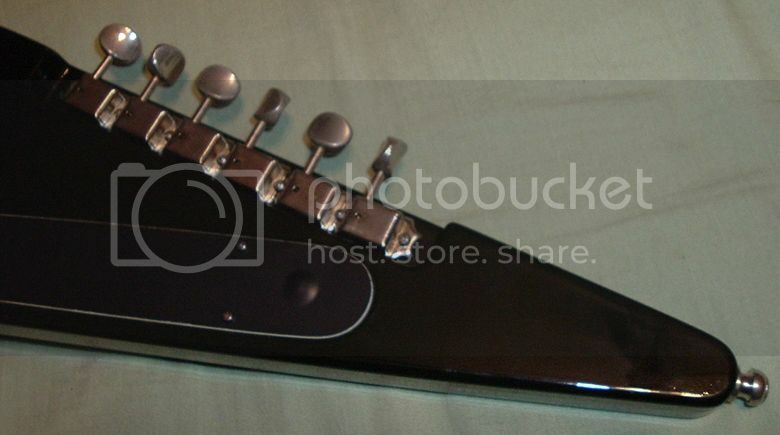 It's of a bolt-on neck construction and my guess is it's Japanese or maybe early Korean. If I had to suggest a brand name for it, I'd consider Hondo who at least were known to dabble with the occasional bizarre design of this ilk. 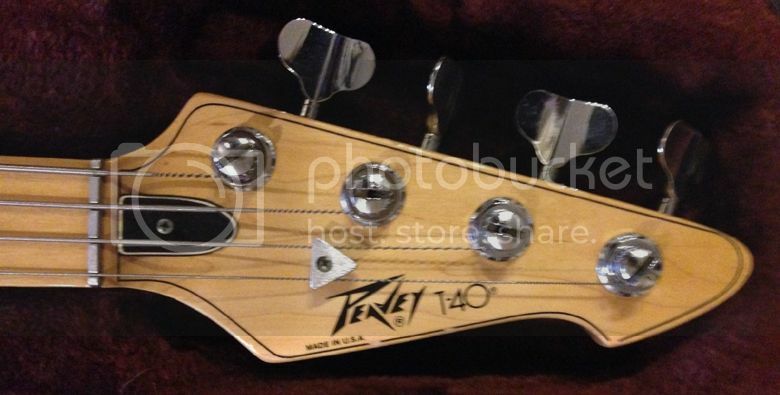 Labels: headless, one-offs, prototypes, Weird guitars, What's that guitar? In more recent times you could pick up one of these all American-made high quality 1970s Peavey guitars or basses for a mere song. I mean why buy a Squier if you can get something as well-made and playable as this, often for less cash, and with that coolness factor that it's a little bit different from what everyone else is playing, a little bit retro. I mean, this Peavey T-40 is an absolute beaut... with a volume and tone for each of the two pickups, you're not going to get the same variety of sounds out of a bog-standard P or J Bass. 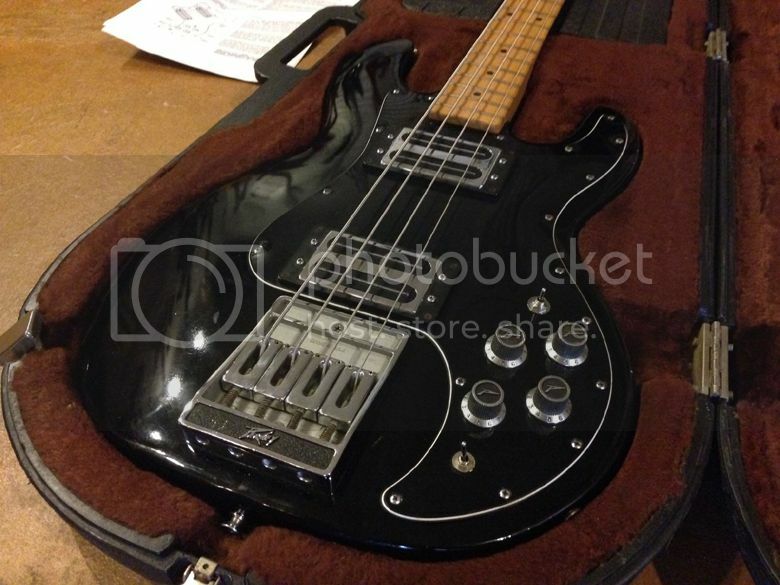 But I think maybe the tide has turned, and with a Buy It Now price of US $599.99 this bass is priced a little higher than most I've seen over the past few years, and to be honest it's a much more realistic price for an instrument of this quality. Grab them while you can and as cheaply as you can because I predict these will be fetching a lot more money in years to come. 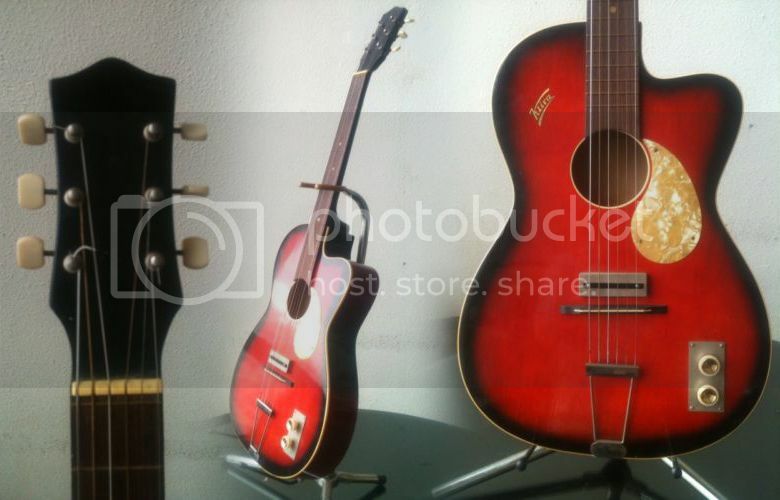 This one is a German Klira guitar. Note the primitive-looking blade-style pickup has been mounted near to the bridge rather than in the more usual soundhole location. Currently listed on eBay with a (possibly) optimistic Buy It Now price tag of €450. I saw this picture on Facebook earlier today. It's a creation of the ESP Custom Shop in Japan. The Facebook post was accompanined by all the predictable "How on Earth do you play that?" comments, all of which are quite obviously missing the point. You don't play it, it's a work of art. It's a similar situation to artist Yoshihiko Satoh's "Present Arms" art pieces (12-necked Stratocasters! ); a lot of these photos have been doing the rounds again virally on Facebook et al, with most commenters simply not understanding that whilst these are technically functional pieces, you are not really supposed to play them. It's their inherent absurdity that makes them objets d'art. 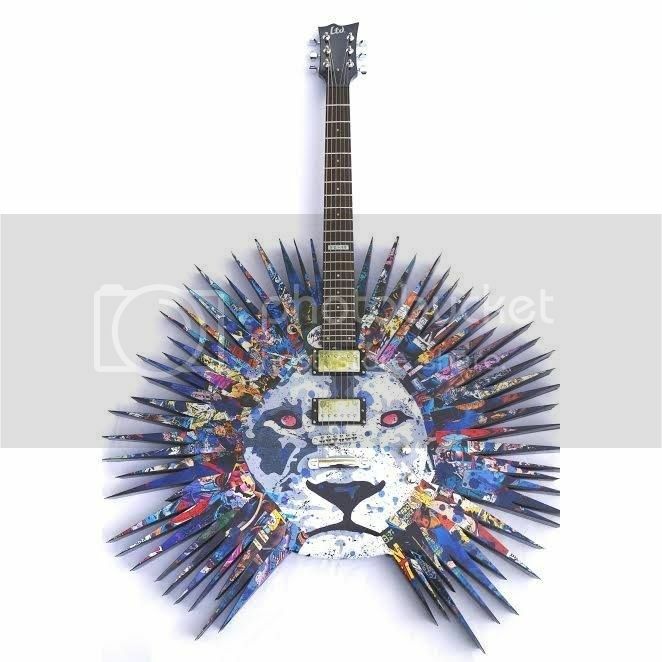 Guitars as art? Why not? I'd hang 'em on my wall if I had the opportunity.